Ceramic Hanukkah lamp found in Teruel, Spain. 15th century. Museo de Teruel inventory #7167. Photo from Birk, Transier, and Werner, Marcus; eds. The Jews of Europe in the Middle Ages (Speyer: Historisches Museum der Pfalz Speyer, 2004), 182. Ceramic Hanukkah lamp found in Lorca, Spain. 15th century. Lorca: Luces de Sefarad. Lights of Sepharad (Murcia, 2009), p 372. Hanukkah is behind us, but not my embarrassment for a mistake on my holiday card that some readers may have received. The ceramic menorah that I labeled as coming from the important excavation of the former Jewish quarter in Lorca, Spain, is actually a similar menorah, also believed to be from the 15th century, that was found in 1977 in the area of the former Jewish quarter at Teruel and is now in the Museo de Teruel (inventory # 7167). 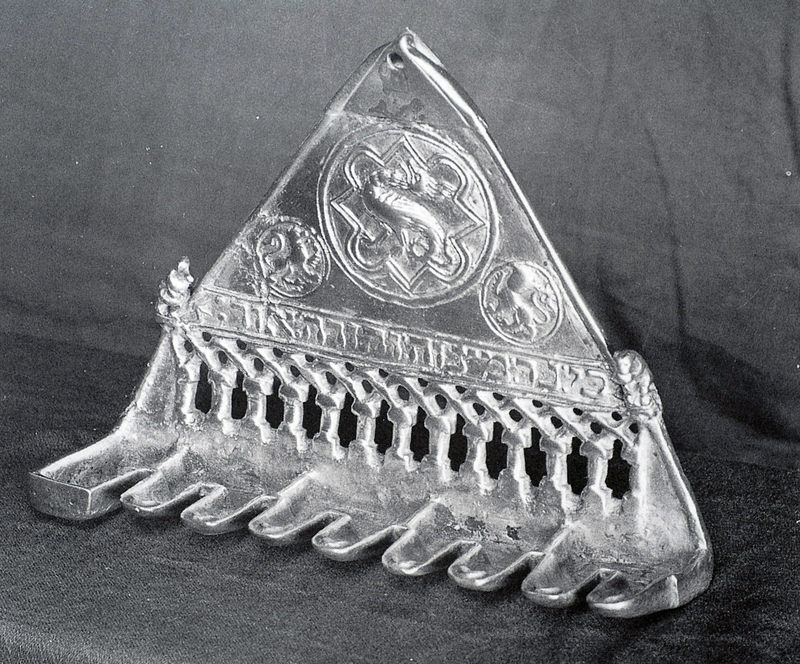 This menorah was seen in the United States in the 1992 exhibition Convivencia: Jews, Muslims, and Christians in Medieval Spain and will be seen again with other items associated with Jewish life in Spain before the 1492 in the upcoming exhibition Fractured Faiths: Spanish Judaism, The Inquisition, and New World Identities, opening May 22, 2016 (tentatively through December 31, 2016) at the New Mexico History Museum. 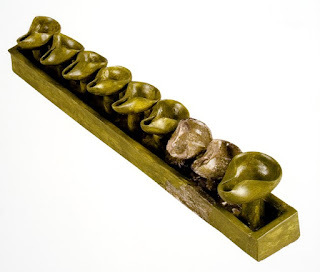 Here too, is the Lorca menorah, which is very similar, but glazed in green. 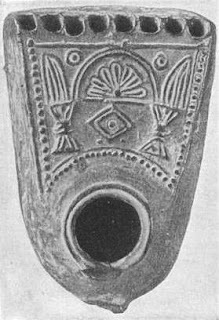 This is one of many Hanukkah lamps and other lamp fragments found in the excavation of houses in the former Jewish quarter of Lorca, just below the castle. 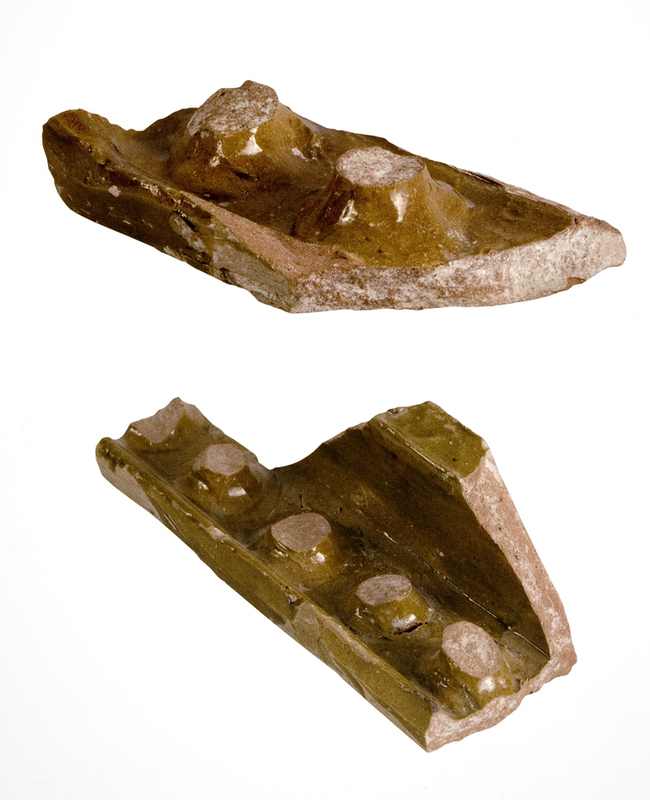 In all, fragments of least five different Hanukkah lamps were found, indicating that lamps of this type were commonly owned by Jewish households. Both the Teruel and Lorca Hanukkah lamps were fragmentary and have been substantially restored to recreate their original appearance. Asunción Blasco Martínez mentions in a essay in the Lorca catalog that the menorahs were stored "in cupboards built into the walls and in closets," but it is not clear whether this is supposition of based on the actual location of the archaeological finds. (In my perusing the available excavation reports I could not determine exactly where the menorah fragments were found). We don't know when and how these menorahs were broken - weather they were discarded as trash before the expulsion of the Jews from Lorca at the end of the 15th century, or deliberately at the time of departure, or later over time either through pillaging of the site. The breaks do not seem the result of natural causes, otherwise more connecting pieces would have been found in close proximity. 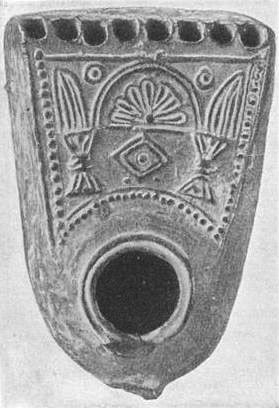 At least one ceramic oil lamps from Hanukkah are known from antiquity. It is assumed that the tradition continued unbroken through the centuries, but examples from an intervening millennium are absent, so we cannot be sure. Ceramic Hanukkah lamp fragments found in Lorca, Spain. 15th century. Photo from Lorca: Luces de Sefarad. Lights of Sepharad (Murcia, 2009), p 380. Two illustrations from Italian manuscripts, now in the British Library, show the lighting of large oil Hanukkah menorahs. It is difficult to know how realistic these are, and whether they would have been found in the home, in the synagogue or in some other public place. The second examples, from the Forli Siddur, appears to take place out of doors. It may be that the large aedicula in which the menorah is set is meant to be a door or window of a house, and the menorah is set outside to bear public witness to the miracle of the holiday. 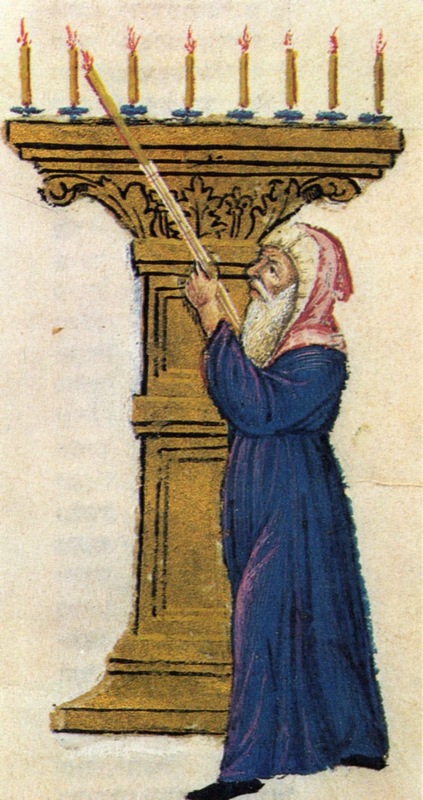 Illustration of a man lighting a Hanukkah menorah from Decisions of Isaiah of Trani the Younger (Pisqei Rabbi Yeshayah Aharon), produced in Central Italy in 1374 by Jekuthiel ben Solomon of Bologna (scribe). Names of artists are unknown. British Library Ms. Or 5024, fol. 19. 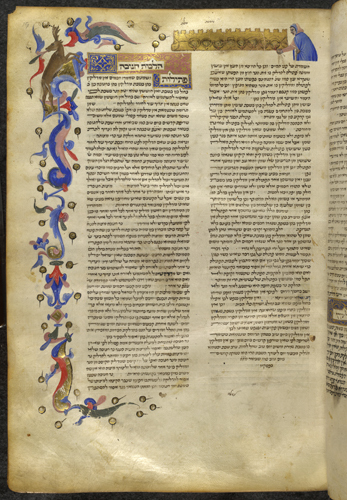 Forli Siddur, British Library, Ms. Add. 26968, fol. 101, Part 2, completed in northern Italy (Veneto? ), 15th century. Is this menorah being lit outside the door or window of a house? The use of the Hanukkah lamp in the home is mentioned in the Talmudic period, but not physical examples of such lamps have been found from before the 15th century. 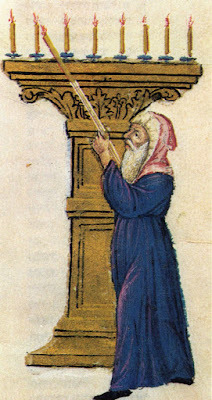 From as least the 11th century, there is also mention of the use of the Hanukkah lamp in the synagogue, and this use is explained in more detail by Joseph Caro in the 16th century. There are a few 15th century manuscript illuminations from Italy that represent large menorah being lit, presumably in the synagogue. 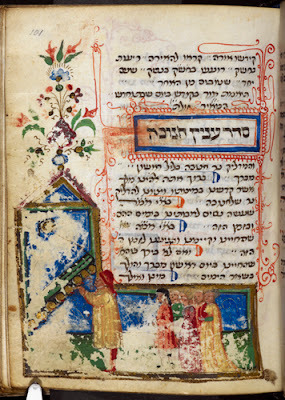 Thérèse and Mendel Metzger have noted that the Hanukkah menorahs with candles depicted in manuscripts that appear to be in synagogues, are all of the types with a straight base upon which the candles are set, not in the traditional branched form familiar from depictions of the Temple menorah dating back to the Arch of Titus in Rome. These manuscript examples are Italian, so there could be a regional preference, but it more likely an adaptation from the earlier oil lamp type. As art historian Vivian Mann explains, synagogue menorahs are "said to have been introduced to accommodate travellers, whose needs likewise inspired the public recitation of kiddush, and sanctification over wine before the Sabbath. Other reasons (enumerated by Joseph Caro in Beit Yosef commentary to the Arbah Turim, cited by Mann) given were pirsumei nisah, publicizing the miracle of Hanukkah, and teaching congregants the correct order of the blessings." Mann maintains, however, that "none of these rationales, however, account for the timing [late Ottonian/Early Romanesque period] of the appearance of synagogue Hanukkah lamps." She proposes that the introduction of large synagogue menorahs to commemorate Hanukkah could be a reaction to the appropriation of the Jewish menorah by Christianity in the Carolingian and Ottonian periods, when score of large menorahs were placed in churches symbolizing that the "Church was the successor to Judaism." The earliest (of more than fifty) surviving example is the menorah "dedicated to the Essen Minster by Abbess Mathilda, granddaughter of Otto the Great, around the year 1000." In Northern and Central Europe, there was also a tradition of metal oil lamps especially made of the Hanukkah observance. Many of these have architectural motifs and it is on this basis that most of dated. A few examples, such a one in the Musée d'Art et d'Histoire du Judaïsme in Paris, have been dated to the 14th century, but most well known metal Hanukkah lamps are from the 15th and 16th century and later (and one should beware of the many copies for sale). All dates for menorahs should be accepted with caution. Unlike the Spanish ceramic menorahs, these bronze and brass menorahs would have been the exceptions, probably expensive and owned by wealthy Jews and kept as family heirlooms. Birk, Karin; Transier, Werner; Wener, Marcus; eds. The Jews of Europe in the Middle Ages with contributions by Alfred Haverkamp et al. (Speyer: Historisches Museum der Pfalz Speyer, 2004). Carrillo, Juan Gallardo and González Ballesteros, José Ángel “La Judería del Castillo de Lorca a Partir de las Evidencia Arqueológicas,” in Lorca: Luces de Sefarad. Lights of Sepharad (Murcia, 2009), 48-77. 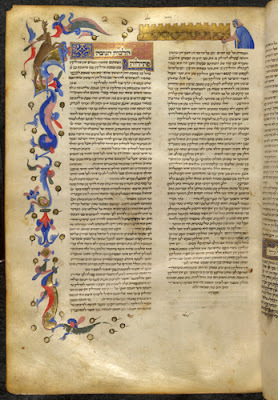 Mann, Vivian, “Towards an Iconography of Medieval Diaspora Synagogues,” in C. Cluse, ed. The Jews of Europe in the Middle Ages (Tenth to Fifteenth Centuries (Proceedings of the International Symposium held at Speyer, 20-25 October 2002, (Brepols, 2004), 341-351. Martínez, Asunción Blasco, "La Vida en la Juderia," in Lorca: Luces de Sefarad. Lights of Sepharad (Murcia, 2009), 22-45. Metzger, Thérèse and Mendel, 1982. Jewish Life in the Middle Ages: Illuminated Hebrew Manuscripts of the Thirteenth to the Sixteenth Centuries (Secaucus, N.J.: Chartwell Books, 1982, 70-71, 74. 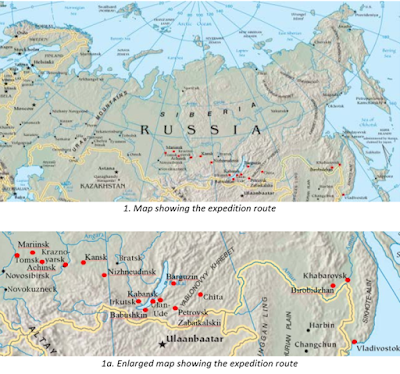 (ISJM) In August 2015, a research team from the Center for Jewish Art at the Hebrew University of Jerusalem went to Siberia and for the first time carried out extensive documentation of the extant Jewish sites in that vast region of the Russian north. This work follow-up on recent excellent detailed surveys of synagogues in Lithuania (published in full) and Latvia (publication in preparation). 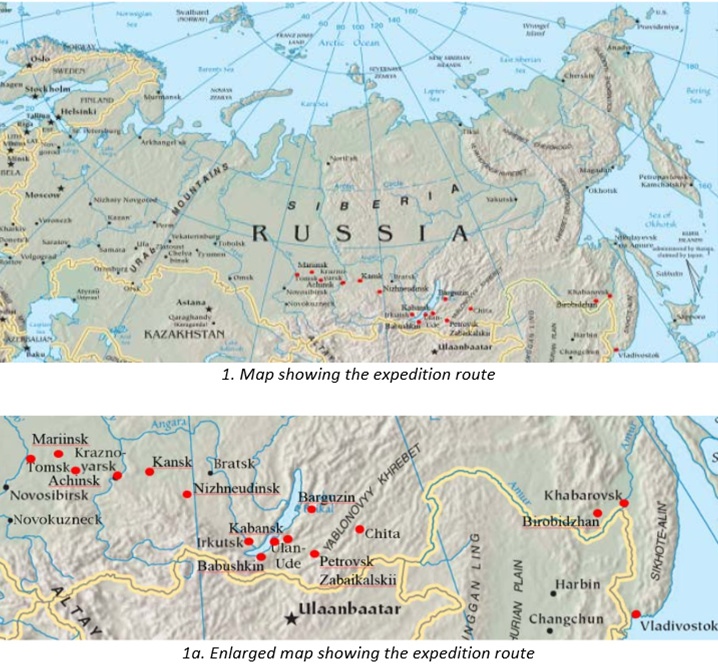 According to their recently released report about Siberia - which can be read in full here - the team followed a route spanning 6,000 km. and visited 16 sites in Siberia and the Russian Far East: Tomsk, Mariinsk, Achinsk, Krasnoyarsk, Kansk, Nizhneudinsk, Irkutsk, Babushkin (former Mysovsk), Kabansk, Ulan-Ude (former Verkhneudinsk), Barguzin, Petrovsk Zabaikalskii (former Petrovskii Zavod), Chita, Khabarovsk, and Vladivostok as well as the Birobidzhan, established in 1928 as the Soviet Jewish Autonomous Region. Sixteen synagogues and four collections of ritual objects were documented alongside a survey of eleven Jewish cemeteries and numerous Jewish houses. The team consisted of Prof. Aliza Cohen-Mushlin, Dr.Vladimir Levin, Dr. Katrin Kessler, Dr. Anna Berezin, and Arch. Zoya Arshavsky. The Center for Jewish Art’s expedition resulted in the documentation and survey of Siberian Jewish heritage in various states: active synagogues, former synagogues serving other purposes, abandoned synagogues in danger of collapse; well preserved and half-destroyed Jewish cemeteries; as well as ritual objects used in synagogues or stored in museums. We hope that our expedition not only documented Jewish buildings, tombstones and objects, but also contributed to raising awareness among locals about the value of Jewish heritage and the need to preserve it as part of their own culture. Siberian Jewish heritage presents an interesting and important example of the convergence of traditions brought from Eastern Europe, fashions borrowed from the capital cities of the Russian Empire, St. Petersburg and Moscow, and local features characteristic of Russian architecture in Siberia. The Jews of Siberia adhered to Judaism and a religious way of life, but within a Russian environment, which strongly influenced them, even more than their relatives and co-religionists in the Pale of Settlement or in the European Russia beyond the Pale. 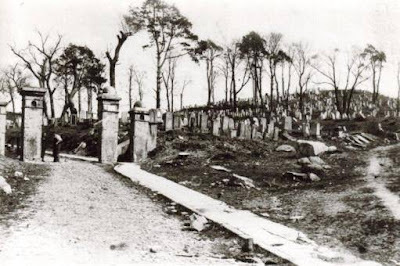 The dualism of the preservation of traditions and a high level of acculturation was reflected in the synagogue architecture and the cemeteries. 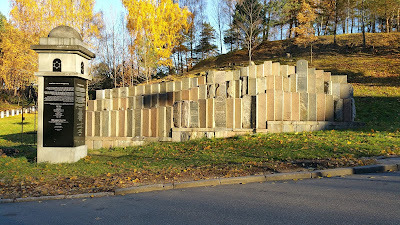 The attempts to express Jewish identity during the Soviet period and growing assimilation are especially visible in the tombstones. Jewish symbols and Hebrew epitaphs gave way to Soviet symbols and monolingual Russian inscriptions. The revival of Jewish life in the post-Soviet era finds its expression in the construction of new synagogues and the reappearance of Jewish symbols in the cemeteries. The material collected during the Center for Jewish Art’s expedition will soon be uploaded to the Bezalel Narkiss Index of Jewish Art (http://cja.huji.ac.il/browser.php). We also plan to publish a book presenting the little known Jewish heritage of Siberia found by our team in this vast and remote region. 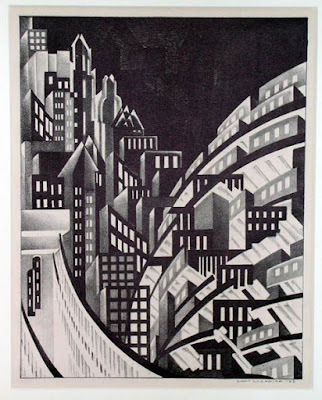 Today is the birthday of American-Jewish artist Louis Lozowick, one of my favorite artists of the dynamic energy of the American city. Lozowick, who born in the Ludvinovka, Ukraine in 1892, came to the United States as an undocumented still-young art student in 1906. 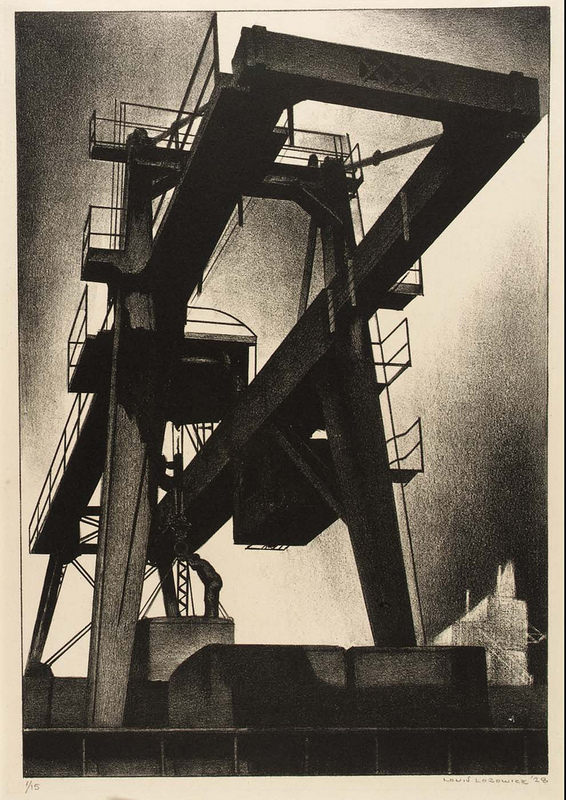 He studied art and graduated from college here, and served in the military before going back to Europe to spend time engaged with the avant-garde art movements of the interwar years. In Paris he was influenced by Leger and Gris, and he learned lithography in Berlin. He was especially influence by El Lissitzky and Russian Constructivism (as can be seen in his 1928 cover for New Masses, below). 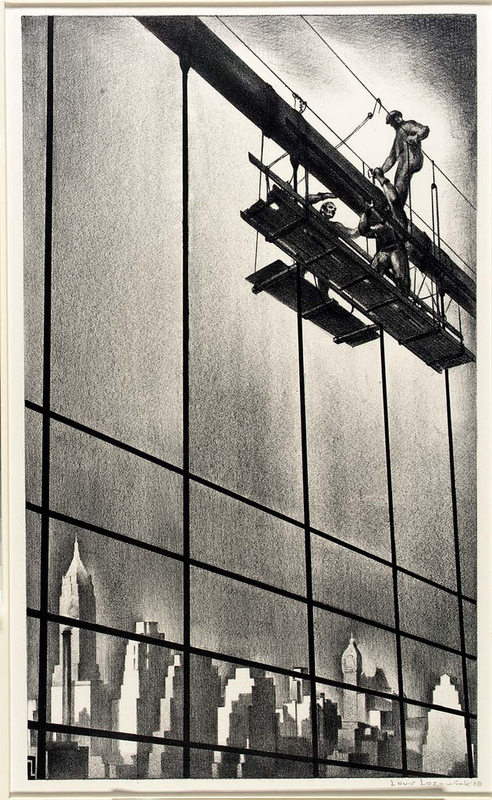 Back in America he became best known for his socially relevant art in New Masses and and then his bold black-and-white cityscapes that captured the stark geometry, steep angles and deep shadows of the new skyscraper city. He loved depicting the engineering of the construction and the intricacy and mystery of machines and today Lozowick is best known for his lithographs of skyscrapers and machinery. But his output was quite varied. He was a consummate draftsman and craftsman, but he also had an eye for the unusual arrangement and incongruous juxtaposition. I'm sure his work influenced many American film noir directors, cinematographers and editors. Unlike many of his Jewish contemporaries (like Raphael Soyer) Lozowick had no problem with being identified as a Jewish artist. But he said "there can be Jewish artists but no Jewish art, unless there be a social need for it," (Menorah Journal, July 1924). He was willing to exhibit in Jewish venues and publish in Jeiwhs cultural periodicals. But he considered his themes and styles contemporary and universal. 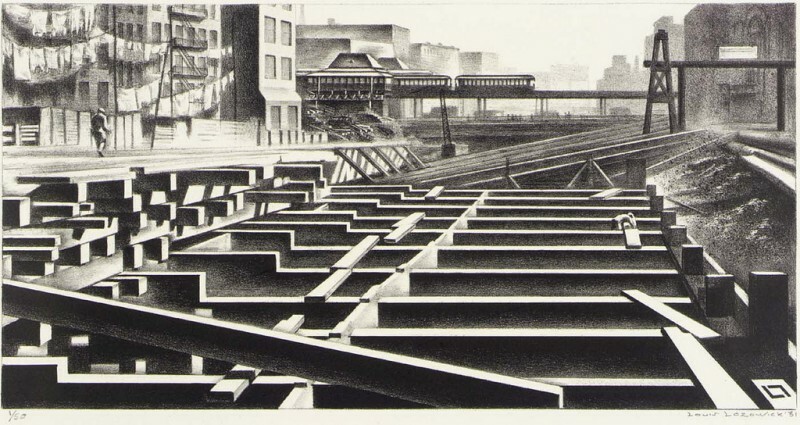 Many art historians have looked at Lozowick's work as part of studies from varied perspectives and as part of different groups or genres (urban, radical, Jewish, New York school, graphics, murals, etc.) but rarely has the spread of his career been considered. Today. 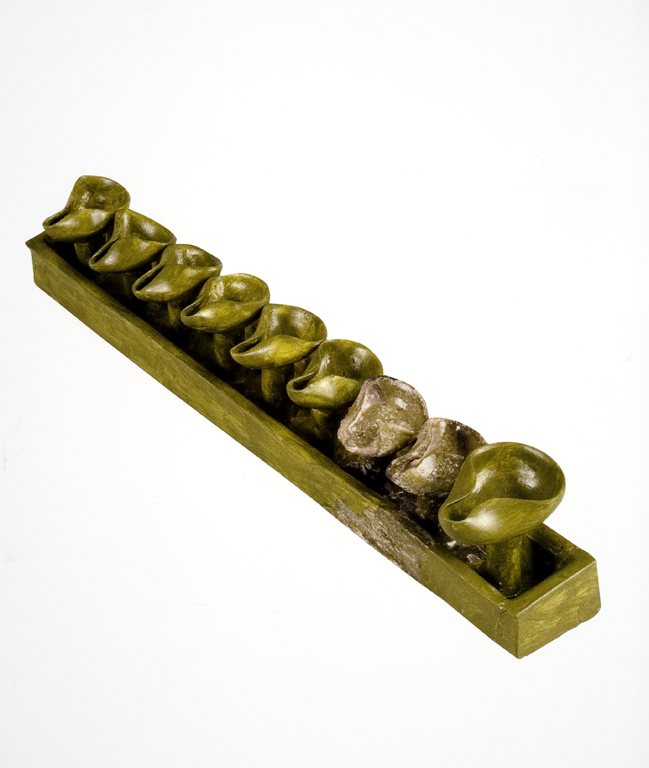 Lozowick has the distinction - perhaps with another contemproary Max Weber, a being a little-known 20th-century great. A major exhibition of Lozowick's is overdue.Maybe in 2023 on the 50th anniversary of this death? Or why not sooner? For a good sampling of his graphic work see here. And even more work here. Here is a biographical information from the Syracuse University Library where a few linear feet of papers relating to his life and career can be found.Much more material is held by the Smithsonian (see the fining aid here). "He attended the Kiev Art School from 1904 to 1906 and emigrated to the United States at age 14 -- a tricky achievement since he came without passport or papers. Once in New York he took a series of factory jobs to pay for his art studies at the National Academy of Design (1912-1915) with Carlson, Leon Kroll, and others. In 1915 he entered Ohio State University, graduating in three years as a Phi Beta Kappa. In 1919, after a brief stint in the military, he left the United States to travel extensively throughout Europe, studying art and supporting himself by writing articles for various European publications. Almost immediately upon his return to the United States, he began his "Machine Ornament" series, exploring the straight lines, contrasting light and shadow, and geometrical patterns of the urban landscape that would fascinate him for the next fifty years. 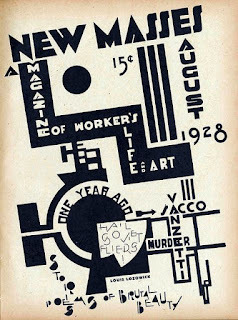 In 1924 he had an exhibit at the New Art Circle and then another at Weyhe's; both Weyhe and Carl Zigrosser, then head of the gallery, encouraged Lozowick in his focus on the graphic arts. 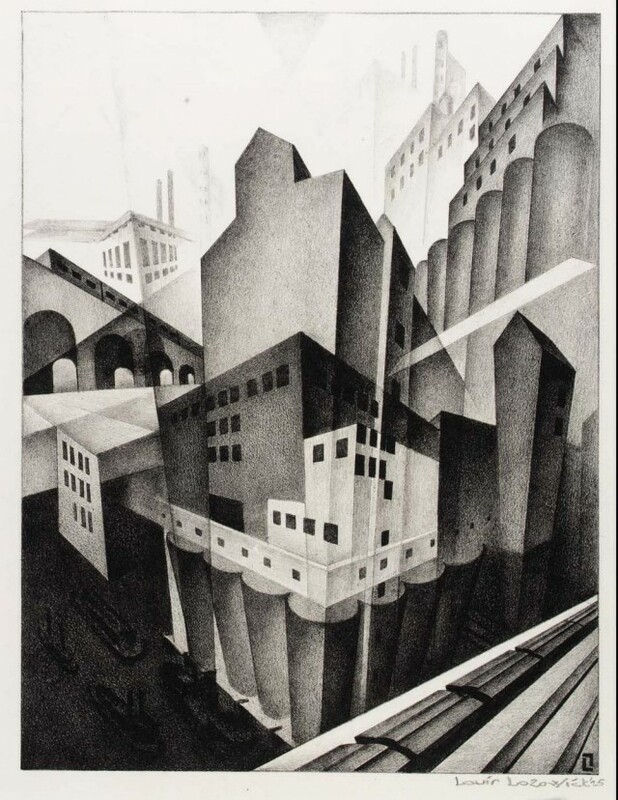 The young artist had a number of exhibits of his lithographs over the next few years at Weyhe's and at Whitney Studio on West 8th Street including his "Machine Age Exposition" in 1927. Throughout his career the complex architecture of the urban landscape -- bridges, scaffolding, train tracks, skyscrapers -- continued to intrigue him (though nature appears more frequently in pieces from his later years). During the Depression Lozowick, like many of his fellow artists, created murals and prints for the WPA including a mural for the New York City General Post Office (1936). In 1931 he married Adele Turner, and in 1943 the couple moved to New Jersey where Lozowick remained for the rest of his career"
Vilnius, Lithuania. Gates to the Uzupis Cemetery. Undated photo, courtesy of Municipality of Vilnius. "The modern cemetery, which was opened a hundred years ago, extends over a vast area, and is intersected with fine long avenues lined with trees. A multitude of tombstones faces evert direction. They are closely huddled together, with epitaphs in Hebrew, Yiddish, and Russian. Some are adorned with framed photographs. The inscriptions are not all of a conventional character, for the tombstone of a famous Marshallik (jester) bears the legend: “Stop and look! You are still a visitor; I am at home.” In the center of the cemetery is a large mortuary, with separate sections for men and women, whither the dead are brought for the last rites; for here all are buried on the day they die. On the opposite side of the avenue is an elevated platform, reached by a flight of steps, form where the funeral oration is delivered. The speaker stands before an iron lectern, flanked on either side by lamps in large glass shades, which are necessary in cases of burial after nightfall." "Here may be seen the graves of the writers Lebensohn and Kalman Schulman, and of all the other luminaries who irradiated the firmament of Hebrew culture in the nineteenth century. Here too may be seen the graves of the victims of various riots and outrages. Nineteen members of the Bund, killed in the revolutionary rising of 1905, are laid to rest together, their sepulcher marked by a stone column from where a memorial address is delivered on every anniversary. The Jews killed by the Polish troopers in 1919 also lie together, some of the graves being marked pathetically “Unknown.” And over the tomb of the Yiddish writer, A. Weiter, who was shot in that outburst of lawlessness, is a striking piece of sculpture – an eagle with a broken pinion." "Among the graves, before the city was retaken by the Russians, a stentorian voice could head every day offering up the prayer for the dead, and rending the air with heart-breaking grief in every note. Scarcely has the sound died away when, form an opposite quarter, the same moving, piercing chant rose again, uttered with even more poignant anguish of spirit, as those seeking to give expression to the infinite tragedy of the Jewish people. These were the voices of poor cantors, unable to find a pittance among the living, and trying to earn twenty groschen a time from those visiting the graves of their dead." [Israel Cohen, Vilna (Philadelphia, Jewish Publication Society, 1943), pp. 416-418. Even with this description in hand the site presently seems incomprehensible. Where was the great mortuary? the steps? the platform for funeral orations? And it will surprise many to hear about framed photos of the deceased and a sculpture of an eagle on a writer's tomb. We cannot generalize about the design, architecture and decoration of Jewish cemeteries. I encourage all readers to look for and collect older descriptions of cemeteries in many languages. I'm sure the Yiddish sources are still rich and mostly unharvested. "As we passed through the huge gates we were surrounded by a number of women, gaunt, blanched, almost fleshless---some with babies at their breast, whining bitterly for alms. Blessing poured upon my head in return for every mite I gave, and after I had been allowed to return to my carriage and wasdriven away I wondered how soon it would be before all those suffering souls would likewise be gathered unto their lasting peace."